We should give the Polish public its due for remembering the tragic events in their history, even in time of economic crisis. This urges us, Ukrainians, despite the whirl of yet another election campaign, to pause and ponder the Ukrainian lessons of the Second World War, all those stormy events resulting from the Ukrainian-Polish-German-Soviet confrontation in the Chelm region, Volyn, and Eastern Galicia. This must have prompted the Polish government and public to take part in a solemn event on Feb. 28, 2009, under the patronage of President Lech Kaczy ski to pay homage to hundreds of Poles who had perished during the Huta Pieniacka massacre, then a village in Brody raion, Lviv oblast. I hope that this day of remembrance will become a day of understanding, rather than division, because both Poles and Ukrainians want to know what actually happened. There can be only one truth, although Polish and Ukrainian historiography suggests that there can be two truths and two kinds of patriotism. Polish literary sources have for many years propagated the thesis that the Huta Pieniacka massacred in February 1944 was committed by a unit of the Division Galicia. However, documents retrieved from Ukrainian and Polish archives testify to the contrary. Andrii Bolianovsky, a researcher from Lviv, has proved that none of the division’s units could have operated in the locality at the time. It is true, however, that the 3rd Battalion of the 4th Galician Volunteers Regiment was briefly stationed in the vicinity of this village toward the end of February 1944, but this unit was not subordinated to the Waffen SS or the division. This unit did take part in the hostilities near the village, but it was against a Soviet detachment commanded by Kundius, including a team of saboteurs made up of ex-convicts. Kundius filed a progress report to T. Strokach, Chief of Ukrainian Partisan Staff, on his unit’s activities from May 1943 to July 1944. It read: “In the summer of 1943, I made contact with N. Stepan’s team of hardened criminals, promising him that his past as a bandit would be forgotten if he worked for the benefit of our Fatherland. I succeeded in putting him to good use… He was killed by Yosyp Naida, resident of the village of Malyi Trostianets and volunteer member of the SS Division Galicia.” He went on to report that toward the end of February 1944 his unit fought Ukrainians “in the vicinity of Huta Pieniacka.” This document is stored in the State Archives of Lviv oblast (Collection P-183 — Group of Underground Organizations in Lviv oblast. — Folder No. 1, Case No. 107; Paper 39-40, pp. 64-65). There is an eyewitness account by M. Khronoviat. He testified before the division’s Military Board on March 7, 1944: “Our men retreated, but the Germans — there was a detached unit of them — stayed and burned down the village.” This testimony is stored at the Central State Archives of Civic Associations of Ukraine (Collection 3971, Folder No. 1, Case No. 7, Paper 43). This Polish document makes it perfectly clear that the Polish residents of Huta Pieniacka were annihilated by the German police and that the massacre was provoked by Soviet partisans who were carrying out saboteur missions behind the Wehrmacht rear lines, paving the way for the Red Army’s offensive against the large garrison deployed in Ternopil. The SS Division Galicia was being formed at the time. According to Jewish eyewitness accounts, toward the end of 1944 “this village was surrounded by Germans who poured gas over the village houses and barns and burned down the village and its residents.” There is a passage to this effect in The Black Book: The Ruthless Murder of Jews by German-Fascist Invaders Throughout the Temporarily-Occupied Regions of the Soviet Union and in the Death Camps of Poland during the War 1941–1945 [also known as The Black Book of the Holocaust, or simply The Black Book], edited by Ilia Ehrenburg and Vasili Grossman, Kyiv, 1991, p. 146). Regrettably, no German military or civilian sources have been found to determine the involvement of particular army or police units in this February massacre in Brody raion. Hopefully, this is just a matter of time. Regrettably, the noted Warsaw-based Polish historian Grzegorz Motyka refers to no archival sources when he claims in his book Ukrai ska partyzantka 1942-1960 — dzia alno Organizacji Ukrai skich Nacjonalist w i Ukrai skiej Powsta czej Armii (Warsaw, 2006) that Huta Pieniacka was “pacified” [i.e., annihilated] by the 4th Regiment of the SS Police, which was made up of Ukrainians, and by the UPA’s Siromantsi Company under D. Karpenko’s command, which allegedly reinforced the regiment (p. 383–384 of the original Polish publication). Polish historians and authors of memoirs, former combatants, are reluctant to recall the acts of terrorism against villages in Nadsiannia perpetrated by individual units of Armia Krajowa and [Soviet-controlled] Polish Army. Last but not least, the disappearance of dozens of Ukrainian and Polish villages from the maps of the Chelm region, the Lemko region, Galicia, and Volyn is graphic evidence of the tragic lot that befell the two neighboring peoples that had often served as cannon fodder in the military confrontations of the 1940s, as part of the pitched geopolitical battle between the two dictators, Hitler and Stalin. Unfortunately, the Ukrainian and Polish politicians failed to reach an agreement at the time. Today, we — scholars, politicians, and statesmen — are destined to pursue tolerant reconstruction of our common past while viewing our future with optimism. Hopefully, Polish government officials will no longer breach Ukrainian legislation by erecting unauthorized memorials — as was the case with Huta Pieniacka at the beginning of 2005, at the time of the Orange Revolution when power was being transferred. Hopefully, both visiting Poles and local Ukrainians will put flowers at the foot of the cross erected in the center of the nonexistent village. We have to unite our efforts to build a common European home. Hopefully, the tragedies of such Ukrainian villages as Sahryn in the Chelm region, where 1,200 residents were killed, and Zaleska Wola in the Przemy l region will be given equally solemn tribute this spring. “Huta Pieniacka is a symbolic site for both Poles and Ukrainians. Here people pay homage to the Polish civilians who fell victim to a German military operation in 1944. The thing is that Huta Pieniacka served as a base for Polish underground resistance and was also used by the Soviet underground network. The latter carried out several operations in which Germans were killed. This caused a retaliatory response from the Wehrmacht, resulting in the destruction of practically all the residents of this village. After completing its mission, the Soviet partisan unit retreated from Huta Pieniacka, leaving it totally expoed to the advancing German units. 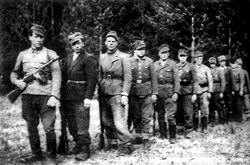 On the other hand, in their mission the Germans used Ukrainians, who were then members of the police units in the Wehrmacht regiment. In other words, Huta Pieniacka is a case study of how the Germans and Soviets were sicking Ukrainians and Poles on each other. Such confrontations left the Ukrainians and Poles seriously weakened, and this allowed the Soviet totalitarian system to assert itself in Poland and Ukraine. “Regrettably, the materials that would reveal the truth about the Huta Pieniacka massacre are still classified in Ukraine. In 2001 the Institute of National Memory of Poland carried out a special investigation in order to ascertain who was involved in the execution of the civilian residents of this village. A large number of [eye]witnesses were interviewed, and considerable data was gathered. However, conclusive identification of the guilty has been impossible, and no names can be called. This requires additional archival inquiries, primarily in German archives because the Huta Pieniacka massacre was an operation of Wehrmacht units. Professor Mykola Lytvyn holds a Ph.D. degree in history and heads the Research Center for Ukrainian-Polish Relations, Krypiakevych Institute of Ukrainian Studies, National Academy of Sciences of Ukraine.